Arranging care for your dog whilst you’re on holiday can be a pain, and not to mention very expensive! An ABI is plenty spacious enough for your four legged friend, after all we’ve designed them to welcome the whole family, and we know your dog is part of that. Please check with you park that dogs are allowed on the site. Snow in June? Who knows! You can store essentials in your ABI, and won’t have to worry about luggage allowances – you’ll be prepared for anything the British weather throws at you! Is your 5-year-old a picky eater? Avoid the complexities of ordering in restaurants and cater to every family members’ preferences, stress-free. Our fully furnished kitchens also make cooking a delight – you’ll be wanting to spend lots of time trying out those new seasonal recipes. You can get to know an area, find your favourite places to eat, go on walks, make friends with your neighbours, and find that beach that suits your family the most. It will really become your home-from-home, where you’ll feel calm, happy and can truly relax. Whether you require fold-up beds, want to watch TV all day or have a relaxing yet powerful shower, your ABI has it covered. We ensure you have the home comforts you need to fully relax, but they’re underpinned by luxury and high quality. Your ABI holiday home decking can be used for family meals in the summer: fish and chips, home cooked meals, fresh salads and a glass of wine or cold beer, or what about enjoying your favourite breakfast with a brew? Set up your deck chairs for a bit of sunbathing, or even fill a little paddling pool for the kids to splash around in. When the weather starts to cool down, wrap up warm to sit and watch a winter sunrise with a steaming mug of hot chocolate in your hands! The options are endless, the views are also pretty good too! Unlike a hotel, if you want to leave your summer shorts or winter boots in your ABI, you can, and they’ll be where you left them! No need to re-pack and pack again, you can personalise your ABI to suit you and leave your possessions there – because it’s yours! Plus, you can accessorise your holiday home with your favourite throws, ornaments and bed sheets – to make it really feel like home. 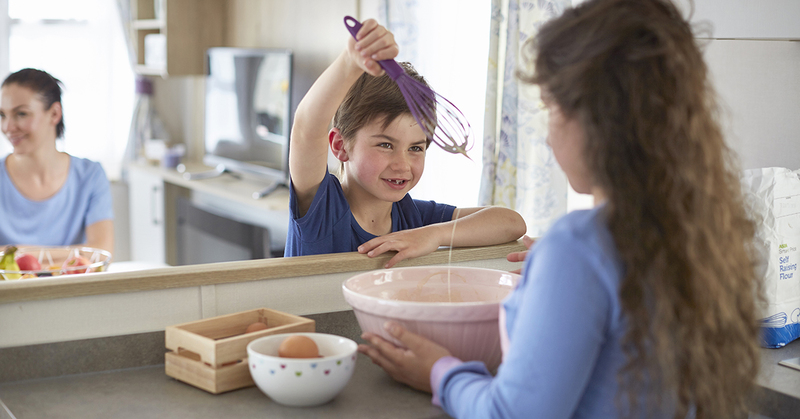 An ABI holiday home is perfect for families wanting a break from normal life. You can relax whilst enjoying home comforts, and most importantly, spend time together. Click here to find your family’s dream ABI. We look forward to seeing you and your family at one of our parks soon!